I only make this recipe once or twice a year, and it is such a treat. The bacon makes this dish so wonderful. This recipe also calls for a great sauce that I had the opportunity to try, Country Bob’s sauce. It is full of flavor. You can find it in Walmart. 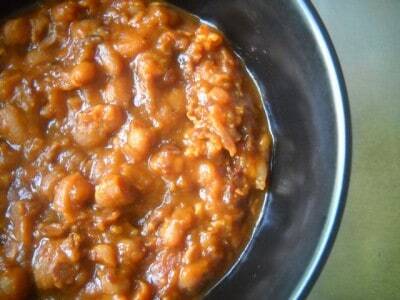 I have also done this recipe without the sauce, and it is very good, but this sauce makes the baked beans extra special. You could also substitute 2 tablespoons of worcestershire sauce. You will either be using a dutch oven in a 250 degree oven for this recipe or your trusty crock pot. Place bacon and onions in saute pan or a dutch oven and saute until onions are tender. Then place onions, bacon, and all other ingredients in your pot. Either place in crock pot on low for 6-8 hours, or in a preheated oven in a dutch oven at 250 degrees for 6-8 hours, or until beans are tender. That sounds delicious with the addition of smoky bacon. This could be good with bread. I think this would be perfect for a rainy day like this. .-= Divina´s last blog, A Taste of Yellow: Tropical Fruit Salad for LiveSTRONG =-. I am going to make this for sure. My mom has a similar recipe. These are sooo good. Thanks for asking me to check it out. .-= Patricia´s last blog, Peanut Butter & Chocolate Eclair Dessert =-. Delicious beans, I love the addition of jalapenos for spice and the smoky bacon – excellent! .-= Natasha – 5 Star Foodie´s last blog, Crêpes with Dragon Fruit, Avocado, Shrimp, and Lime Tequila Cream =-. Hmmm…with smokey bacon…must be terrific with some sourdough bread. .-= Angie@Angie’s Recipes´s last blog, Sesame Crusted Fish =-. I’ve totally been on this baked bean kick lately and this is definitely something I’m going to try… SOON! .-= Peggy´s last blog, Foodie Fights Battle #11 – Chipotle/Goat Cheese: Chicken Adobo Lettuce Wraps W/ Chipotle Tomatillo Salsa & Goat Cheese Queso =-. .-= Short and Bald´s last blog, Taiwan: Lunch at Gu Shine via Flushing, Queens, New York =-. This is so good that I just updated my Foodbuzz profile to say, this is what I am craving! Nice job! .-= Tina Marie´s last blog, Chicken Marsala for Magazine Monday =-. These sound delicious! I have been looking for a good baked bean recipe. .-= Shauna´s last blog, Heavenly Banana Bars =-. .-= Elin´s last blog, Savoury Bacon Cheddar Cookies =-. .-= sizzlechef´s last blog, Braised Soothe Congee =-. I made Baked Beans last night for dinner, but they weren’t near as great as these look. .-= Liz@HoosierHomemade´s last blog, Meals ~ September 14 – 20 =-. This is a great baked bean recipe! Try using some Hurst’s HamBeens® Great Northern’s and the smokey flavor packet adds even more complexity to the delicious sauce. .-= Matt´s last blog, Kenny Chesney Tailgate Party @ Hurst Bean Field =-.